Bill Clinton rode to office on the back of “It’s the economy, stupid.” The gift of a well-turned phrase dumping untold numbers of votes into his lap. It was of course, like all pithy aphorisms, a gross simplification... and so is my title for this blog post. It’s a pertinent observation from the author’s side of the signing table and worthy of note to would-be writers. It’s also perfectly reasonable behaviour from the reader in the queue. After all, few music fans on cornering their pop-star in an elevator proceed to interrogate them about notes and key changes. Prose is the story-delivery mechanism and the story is king. People talk about the story years later, the plot, the characters – they’re less likely to swap lines from the text. 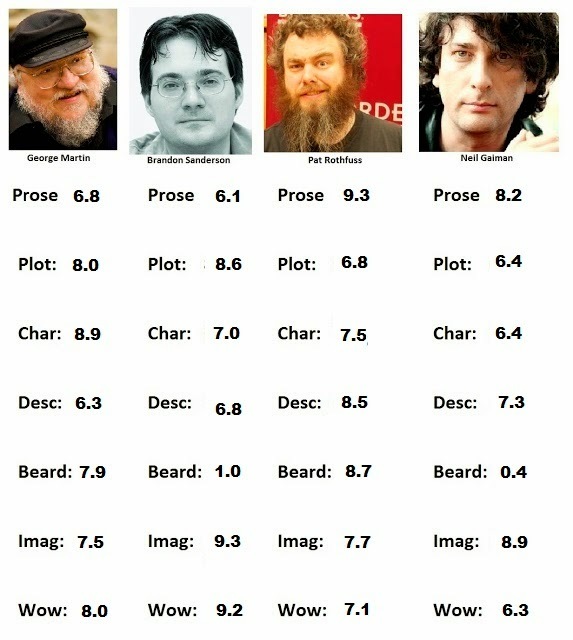 In the Author Top Trumps I ran recently the two highest scorers in ‘prose’ (Rothfuss and Gaiman) were the two lowest scorers in ‘wow factor’. ...prose is the story-delivery mechanism rather like wine/beer/spirits are the alcohol delivery mechanism. Getting drunk isn’t the only reason to drink. Some people really do like the taste. Similarly the story isn’t the only reason to read. Poetry leaves many people cold. Poetry books do not sell that well. Poetry readings rarely pack arenas. But poetry is a very condensed and powerful form that few chose to consume neat. If you add poetry to prose it’s like moving from along a scale from light beer toward whiskey, and when it’s all poetry then that’s absinthe right there, and not so many have the stomach for it. However, there are many people (like me) who are tone deaf... but we still love music. Similarly there are many people who wouldn’t read poetry for pleasure but would rather the prose in the stories they read was seasoned with a little of whatever sets poetry alight. The reader may not notice the language. In most cases it’s a good thing that they don’t. But well written prose, powerful and evocative prose, does its work invisibly, sinking the story hooks deeper, placing the reader in the scene, making them taste it, smell it, making them wince, making them care. Lewis Carroll advised, “Take care of the sounds and the sense will take care of itself.” Oscar Wilde that, “Behind the perfection of a man’s style, must lie the passion of a man’s soul.” The words deliver the story – the prose carries the passion. Poetry is a spice, to be added with care, neither under nor overused. T.S. Eliot, master of the prose poem, said, “prose that is altogether alive demands something of the reader that the ordinary novel reader is not prepared to give.” Which is fine and well if you’re not hoping to sell many books – but if you’d like the ordinary novel reader to have a good time reading your work then balance is required. In the end it's the story, stupid. I know this, and as an author I want to write a great story. For me though (personally as opposed to financially) I want to write great lines, great paragraphs, and great pages. This labour of love is wasted on the large majority of readers. I know this, but it doesn't stop it being of prime importance to me. There's a magic that can be injected into a single sentence and give that handful of words space in the imaginations of a million people. I have found few pleasures greater than the search for that magic. “But who knows what she spoke to the darkness, alone, in the bitter watches of the night, when all her life seemed shrinking, and the walls of her bower closing in about her, a hutch to trammel some wild thing in?" What is Grimdark? It's a phrase that gets thrown around a lot - often as an accusation. I've seen lots of articles describe the terrible properties of grimdark and then fail to name any book that has those properties. b) some actual books that are that thing. There were ~150 comments. 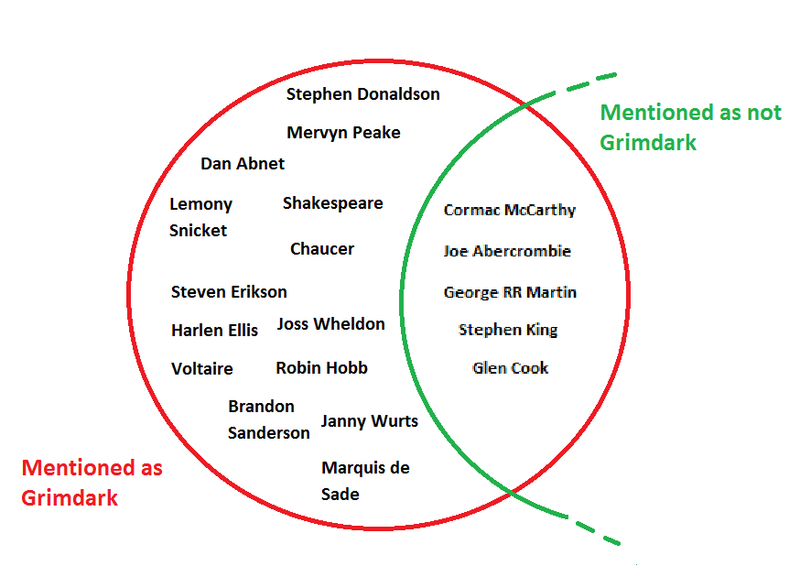 Here are the authors who were either mentioned as having written a grimdark book or having been mentioned in that category then had somebody else argue that they were not. So, that should have cleared that up then! Here's the lethality radius of a modest (1 megaton) nuclear bomb dropped on Joe Abercrombie's house. You can see it would be a poor day for myself and Luke Scull too - both of whom have in the past (though not in this exploration) been accused of / praised for writing grimdark. The same bomb drop on a larger scale map! 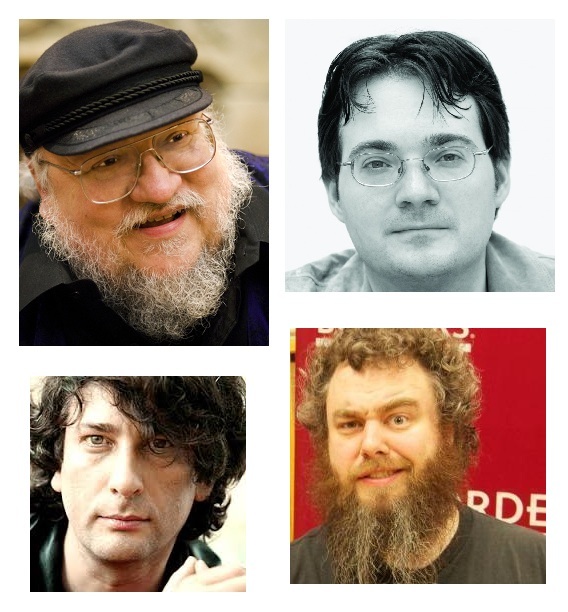 Fantasy Author Top Trumps - crowd sourced! 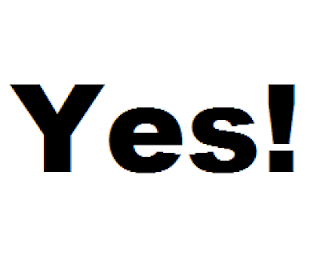 Vote at the bottom of the page. If you're as old as George Martin, or Neil Gaiman, or... me, you'll remember a dark time, a time before the internet, a time before computers, before handheld electronics... and in that dark time a game called Top Trumps (which still exists) wherein you faced your opponent with half a deck of cards, each card sporting an example of the trump in question (tanks, sports cars, military jets etc) and you'd choose an attribtute from your trump that you hoped would beat his. Top speed: 1800 mph ... or Wheel-Base 4.8 yards etc. Like I said these were black days where raindrop racing on window-panes was still considered entertainment. Each author has a poll where you can vote on Prose / Plotting / Characters / Description / Beard / Imagination / Wow factor - the options are for 10 / 5 / 0 points. When averaged these will create a value between 0 and 10. I've long held the conviction that the difference between success and failure at the top of any game is a matter of tiny fractions of... something. The man who comes 20th in the Olympic 100m is still stupidly fast. The 300th best basketball player is incredibly good at what they do. And yet Mr 20th and Mr 300th earn a tiny fraction of what the Usain Bolts and Magic Johnsons do and very few people know their name. I have a dirty secret... under my glossy writer exterior... I'm a physicist. And every now and again my science side escapes and stomps over some corner of the writing lawn with its science boots on. Today it wants to tell you about how the business of success is a highly nonlinear affair. The mathematician in me could waffle on about feedback loops and reinforcement but the physicist likes to keep it simple (believe it or not, simplicity is the goal of all physicists). There was a farmer that was having trouble with a cow that didn't produce good milk. The farmer decided that he'd hire three experts to figure out what was wrong with the cow. He hired and psychiatrist, engineer and a physicist, and gives them each a day with the cow. After the first day, the psychiatrist comes to the farmer and explains that the cow is not happy inside the barn, and that the inside of the barn should be painted green, so that the cow will feel more at home. The farmer isn't sure so he asks the engineer to give it a try. After the second day the engineer comes to the farmer and tells him that the cow isn't being milked efficently, and gives him draftings of a very efficent milking machine. Still not convinced, the farmer asks the physicist. After a day of study the physicist goes to see the farmer. The physicist walks to a chalkboard and draws a big circle and says "Imagine the cow is a sphere..."
So in short, I'm going to make a ridiculously simple model that I hope captures some essential elements. Let's take two authors who each start with 100 readers (random pick-ups due to launch day publicity say). Now let's say from that point on new readers are gained by old readers convincing people to read the book. Let's say that each reader convinces r new people to read the book and that they do so in the week after reading it themselves. Let's take two authors, call them Maz and Mark (just for kicks). Let's say Maz's readers each convince, on average, 0.95 people to read the book, and that Mark's readers each convince 1.05. These authors appear to have written books of pretty similar saleability. One is not great and the other bad. They are both good, and the difference between their ability to inspire their readers to recommend them is fractional. It's shown below as height. Let's work out their sales after 18 months. So, yes, cows aren't spherical (though they can be rolled), but the fact remains that the difference between selling 10 books, 10,000 books, 10,000,000 books comes down to fractions. The work of many brilliant writers goes virtually unnoticed while we build temples of worship to others whose tales have just that fraction more ability to move us. No, stealing a book on the internet is not the same as borrowing it from a library. I was asked today: "Is there *that* much difference between pirated books and those borrowed from the library." They buy lots of hardcovers. When the library has loaned the book a certain number of times, they buy a new one. If the book is popular and the library want to be able to loan the book to several people at once... they buy several copies. In the UK, each time a book is loaned out, the author is paid ~10 cents. For many new authors sales to libraries make up a significant portion of their income/livelihood. 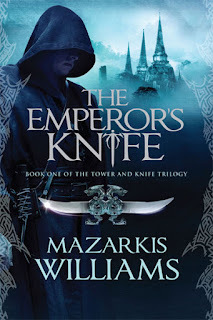 Mazarkis can't tell you exactly how many copies of The Emperor's Knife sold in the US because the publisher Nightshade Books is in collapse, undergoing takeover negotiations, and on the very verge of bankrupcy. However, using bookscan figures she can estimate US sales of 1800 copies in hardcover. Many of these will be at considerable discount, yeilding smaller royalties. 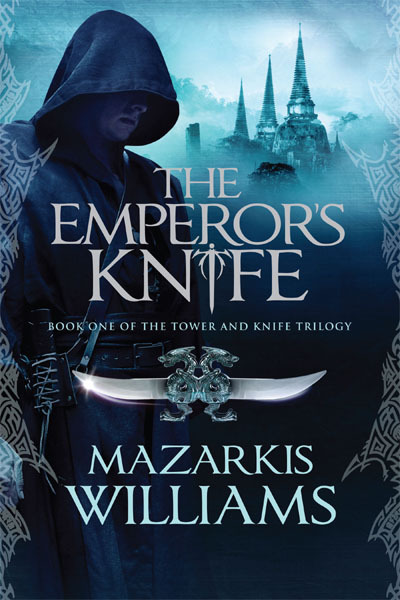 Worldcat.org lists The Emperor's Knife as being available in 282 libraries in the US. - Even if each library has only one copy of the hardcover and never replaces it. ...that's still around 15% of total sales, and at full price accounting for more than 15% of royalties. And this figure is a significant underestimate. So, to recap. When you borrow from a library the book has been purchased. If it wears out it needs to be replaced. Only one person can read each book at a time. Library sales count for a significant chunk of many new writers' income at a time when they need it most. If you steal the book electronically - everyone stealing it can read it at the same time from a single hacked copy. As stealing increases the libraries contract and close, authors find it even harder to make ends meet, more publishers fold, and we steal ourselves into a new world. I thought I'd do a little information gathering regarding my readers. I posted this poll on my facebook and twitter feed and at the time of posting have nearly 300 responses. 20% of my followers/friends bought the hardcover. And 5% of the people who've bothered to friend me on facebook or follow me on twitter pirated a copy. That's about the same as the numbers buying the hardcover off Amazon... which ain't good! I suspect in the wider population that last percentage is considerably higher. However, as a glass half-full kind of chap, I'm heartened that 95% of responders appear to have obtained a copy legally. Additionally 88% of the copies were acquired in a way that went some way toward paying for the effort I put in over several years and for the publishers' investment and time. I was worried the picture was going to more grim, even among people interested enough to see the poll. And 11% pirated a copy. I'm suprised that the percentages buying hardcover and paperback vary so much between the surveys. Sad to see that as many copies are stolen electronically as are purchased in hardcover in bookshops. The Great Book of Thorns! Shawn Speakman's mega-anthology is released this year and I'll be getting one of the 500 leather bound editions - a limited set that sold out very quickly at $150 each. I saw recently that Terry Goodkind had sold his work in a limited set of leather bound volumes (plus extras) at $300 each, and sold out within hours. And Terry Brooks is canvasing his readers over leather bound boxed sets at $500 and getting a ton of interest. I'm wondering if this is becoming a new model, certainly for established top sellers like Brooks and Goodkind. I can understand that for many people who grow up with a particular author's work from an early age the stories can become part of the landscape of their imagination. That breeds a particular kind of loyalty of the type that will set those readers in later (more affluent) life to digging deep for a special book. The age of e-theft has seen musicians increasingly forced to make their living by touring rather than by selling their songs. Is the super-book the authors' equivalent? With our work being stolen at an ever increasing pace does the hope for making a living rest with book collectors rather than simply book readers? High quality hardbacks for smaller fry like me and leather bound objects d'art for legends of the genre? 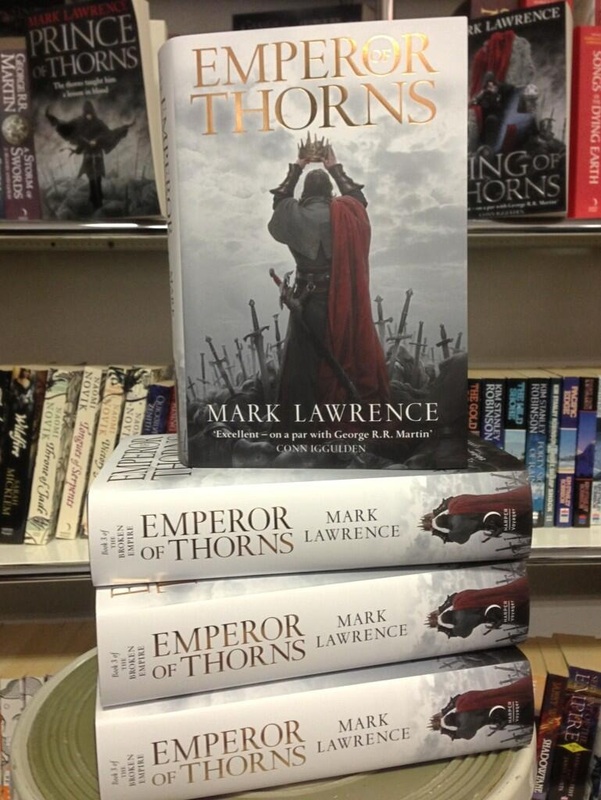 Well, I've long harboured an ambition that if the Broken Empire trilogy does really well it should one day be re-released in a single edition - a Great Book of Thorns. Inspired by the above the day dream is now that if the books ever made it big enough then in twenty years time, rocking in my armchair within my retirement pod, I will be able to emerge briefly from my virtual reality cyber world and smile toothlessly at the leather bound, hinged, clasp-locked Great Book of Thorns on my shelf and think it a job well done. The books have been printed! I don't have one yet... but I can lick the screen. Suprisingly early (release date is August 1st (UK) / 6th (US)), but they exist, so put to bed any worries of delay etc. It's a surprisingly poignant thing to see the last book of your first trilogy roll out. More so than with the first one. Rather like the difference between seeing your child born and packing them off into the wide world.